The Arte Flamenco Dance Theatre has opened a school dedicated to the study of the art of Flamenco, Spanish Classical and Regional Folk dance, along with creating a home for the Arte Flamenco Dance Theatre Company. Teaching Staff Ahmae, Kamala, Olga Perez, Rocio Ponce, Diane. Clarita, dancer, teacher and choreographer has an extensive background in all facets of Spanish dance, covering regional folk dances, Escuela Bolera (the original form of Spanish dance), and of course, Flamenco. Residing in Seville, Clarita's talent was recognized by Seville's leading male dancer Curro Velez. Mr. Velez presented her at "El Arena,l, one of Seville's foremost tablaos(Flamenco Club). From there, her dance career exploded. 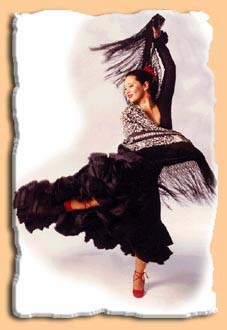 She was then featured at both "El Arenal and El Meson", where she performed with "La Familia Montoya", one of Andalucia's premier dance families. Clarita (named "La Clara") was recognized as a solo artist in her own right and began to tour Spain and Europe with Spain's top flamenco personalities. She was commissioned to perform along with Juan Peña, "El Lebrijano" for the opening of Artespaña in Orlando, Florida at Disneyworld. She also performed with Chano Labato, Enrique "El Extremenio", and El Toro. Performing on television, at festivals and Peña Flamencas (private flamenco clubs), her popularity grew and she was invited to perform for the family of the former President of Spain, Felipe Gonzalez and the British Ambassador hosted by the Governor of Andalucia Sr. Borbolla. Clarita began her dance career at the age of six. After many years of study in the United States with the top names of Spanish and Flamenco dance such as Jose Greco, Jose Molina, Luisa Triana, Dolores and Jose Fernandez, she went to Spain. There she continued to master the art of Spanish Classical , Regional and Flamenco dance in Seville, with Manolo Marin, Mario Maya, Juan Manuel and Mancilla & Margarita "Los Gitanillos de Bronce"(original members of the Jose Greco Dance Company) and Juana Amaya. In Madrid, she studied with La Tati Cristobal Reyes. In 1989, Clarita returned to the United States and created the Arte Flamenco Dance Theatre, a company consisting of 15 dancers, singers and musicians. Touring the United States, Arte Flamenco has become a renowned representative of Spanish/Flamenco dance. Clarita has devoted her life to mastering and preserving this specialized art form through performing and teaching. Currently, she has an extensive school in Los Angeles, and participates in school programs, demonstrating the dance and its techniques. The Arte Flamenco Dance Theatre & Dance School, 230 W Main Street (two blocks E of Atlantic) in Alhambra, CA 91801, Phone 626/458-1234 Fax 626/458-0113 Email presents BELLYDANCE CLASSES: Aubre teaches Beginner Level belly dance, Level one with Cymbals, and Level 2 and 3 PLUS we have Mixed Beginning Level One bellydancing classes with Kamala.